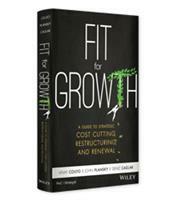 Fit for Growth offers a unique approach to business transformation that connects growth strategy with cost management and organization restructuring. Drawing on 70-plus years of strategy consulting experience and in-depth research, the experts at PwC’s Strategy & lay out a winning framework that helps CEOs and senior executives transform their organizations for sustainable, profitable growth. This approach gives structure to strategy while promoting lasting change. The three essential actions for becoming Fit to Grow. Why growth requires cuts and how to achieve both. Smart levers to restructure costs. Strategies to help leaders, managers and employees embrace large-scale organizational transformation.